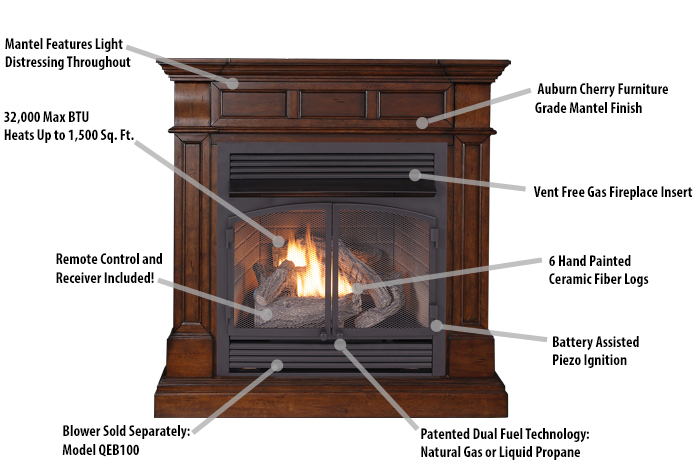 The Duluth Forge Ventless Fireplace features our Furniture Quality fireplace mantel and our Dual Fuel, Vent Free Gas fireplace insert that provides you with heat and beauty. The product is made to produce up to 32,000 BTU of heat, enough to heat 1,500 square feet of living space. The fireplace provides a beautiful and realistic flame pattern with realistic fiber ceramic logs for a stunning home experience. The cherry wood tone creates a nice contrast that completes the look of your home.